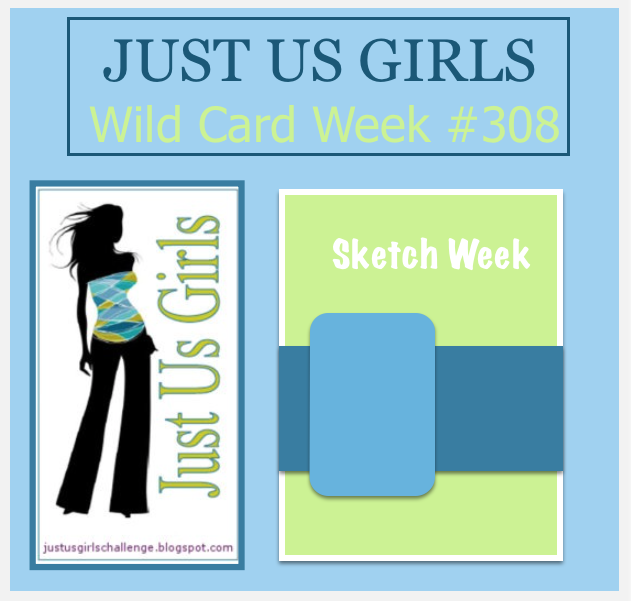 Hello Friends, I am hosting this week over at Just Us Girls and it’s the 5th Saturday of the month, which means it’s Wild Card Week, and I decided it’s past time for a sketch challenge! We also need to say farewell and thanks to our wonderful Guest Designer for this month Karen Bourke. We sure do appreciate you being with us! Here are a few details: The large label stamp is from Gina K and the butterfly punches are from Stampin Up. I do believe the sentiment if from Verve….but I am not 100% sure. Paper is this and that from my stash! Categories: Cards | Tags: Card making, Cards, Gina K designs, rubber stamps, Thank you card | Permalink. That is a gorgeous card design and great colors too. LOVE this color combo and your butterfly is BEAUTIFUL! Beautiful! I love that label, it’s one of my favorites and that layered butterfly is so pretty. Love your color combo, too. Great choice for our Wild Card Week. Very classy looking card — great sketch too! Gorgeous card Nancy. Love the color combo and your sketch. Absolutely gorgeous Nancy. Beautifully made. The DP label butterflies and flourish just go together perfectly. Great sketch. This is such an elegant card, Nancy. Beautiful card, Nancy…..gotta love that color combo! Love that large label stamp and the pretty butterfly! Great sketch! I was so happy to see a sketch challenge! I’d be lost without them! LOL! I like the color combo you used on your card, and the pretty frame and butterfly are gorgeous! Another beautiful card. I love the frame and the colour combinations.